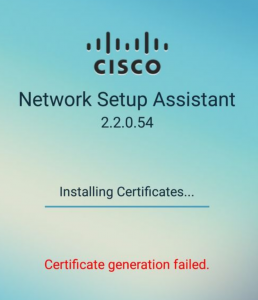 Ran into some issues recently with Android devices and the Cisco Network Setup Assistant while attempting to provision certificates as part of the BYOD work flow. TAC pointed me to this helpful YouTube video that contained the solution. Starting with Android 6, EST is natively used by the device for Certificate Signing Requests. To fix the issue we need to allow the EST authentication request through ISE. This can be accomplished with a new Authorization Policy that matches the EST request and then permits access. To create the rule first navigate to Policy -> Policy Sets. Under Results -> Profile, select Permit Access. Try to enroll your android device again and you should now be successful in EST authentication and device provisioning.